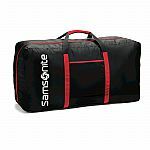 Samsonite eBay has select bags on sale. Shipping is free. who cares? they are talking rubbish anyway //@Anonymous: English please, pengyoumen! I have one too. Very versatile and durable, and good for this price. //@anonymous: The bag quality is good. I traveled a couple times I brought with me. Bag size is huge enough for 2pcs 5-6 cups rice cookers with box when you fold it up like a novel book. I used to put non fragile stuff in this bag, value item in my luccage //@anonymous: English please, pengyoumen! The bag quality is good. I traveled a couple times I brought with me. Bag size is huge enough for 2pcs 5-6 cups rice cookers with box when you fold it up like a novel book. I used to put non fragile stuff in this bag, value item in my luccage //@anonymous: English please, pengyoumen!